Absorbant Material At Closure For Fly Spray Application! Weaver Fly Mask With Xtended Life Closure System - With Ears And Nose. Patent pending replaceable closure system extends the life of your gear and features absorbent material that can be soaked with fly spray for added protection. 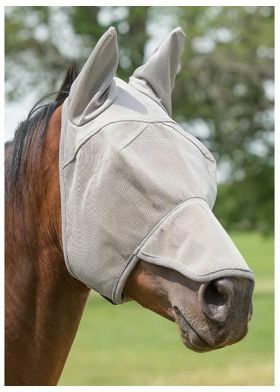 This innovative design eliminates the need to spray chemicals that may sweat off reducing effectiveness directly onto your horse’s sensitive face. Extended nose piece helps give extra protection to your horse and is great for white faced horses, in preventing sunburn. Absorbant material on closure for application of fly sprays. Grey Mesh with polar fleece edges. Contoured at neck for sleek fit. Reflective piping over the nose for visibility. Breathable lightweight material at top.